It’s not like the old days when most brands kept a tight lid on their Super Bowl plans until the game. In some cases, it wasn’t even known that a brand was advertising in the game until the spot ran. Now, brands start talking about their plans months before and the majority show off their creative before the actual game. More than 40 brands have revealed they are running national spots in the game on Sunday. Here is the list, courtesy of iSpot.tv, the TV ad measurement company: Amazon, Avocados from Mexico, Bud Light, Budweiser, Coca-Cola, Doritos/Mountain Dew, Duracell, ETrade, Febreze, Ford, Groupon, Hulu, Hyundai, Intuit/Turbo Tax, Jack in the Box, Kia, Kraft, Lexus, M&Ms, Michelob, Monster Products, Natural Light, Paramount Pictures, Pepsi, Persil Pro Clean, PETA, Pringles, Quicken Loans, Skittles, Sprint, Squarespace, Stella Artois, Tide, Tostitos, Tourism Australia, Toyota, Turkish Airlines, Universal Pictures, Universal Parks & Resorts, Verizon, Weather Tech, and Wendy’s. Another brand keeping things mysterious is Hyundai, which revealed only a very vague teaser spot for its 60-second spot, which will run in the fourth quarter. The automaker says the campaign “will surprise and thank millions of people who have contributed to the fight against pediatric cancer.” For the first time ever, Hyundai will feature its non-profit organization, Hyundai Hope On Wheels. It will include content captured on game day. The company shared creative details, including how the footage would be captured, with select media outlets on Thursday (including MediaPost), but it is under embargo until after the spot airs. The automaker also is airing a second ad, a traditional product-oriented 60-second spot featuring the Hyundai Kona subcompact SUV that will run before the game. It’s the brand’s first national advertisement for the new SUV. Both Hyundai spots are from AOR Innocean USA. Another brand running a spot prior to the game is DiGiorno pizza, which will debut a spot 30 minutes before kickoff. Creative reveals how the pizza maker used facial recognition and emotion-tracking software to measure which pizza made for happier gatherings: fresh-baked from the oven or delivery. As usual, celebrities are big this year, showing up in ads from Pepsi (Cindy Crawford) to Jack in the Box (Martha Stewart) to Amazon (Cardi B, Rebel Wilson and Anthony Hopkins). 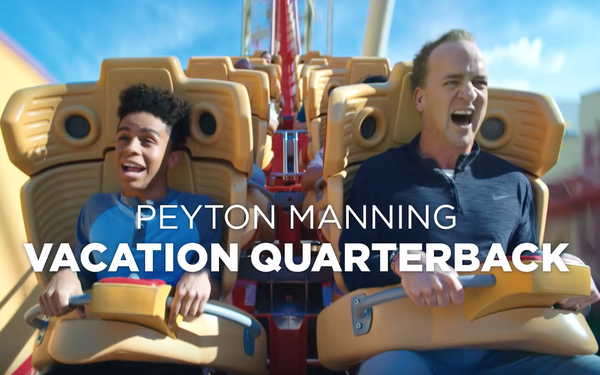 Peyton Manning becomes vacation quarterback to America in a Universal Parks & Resorts spot where he coaches families to take their vacation to the next level at University Studios Hollywood and Universal Orlando Resort. An extended version of the spot will air in the NBC pre-game show and a 30-second version of the commercial will air during the Super Bowl. According to System 1, pre-game testing of the spots indicate the Universal Parks & Resorts spot is best-received, followed by M&Ms with Danny DeVito and Michelob Ultra with Chris Pratt. Spots not testing well are Skittles, WeatherTech and Sprint. Super Bowl promotions don’t end wth the game. Redbox hopes to ease the pain of defeat for the losing city with a free movie or game rental. Depending on the outcome, forlorn fans in either Philadelphia or Boston/Providence can use the code "CHEERUP" to redeem their prize. The code will be active in “losing” markets starting Feb. 4 at 12:01 a.m. and expires Feb. 5 at 11:59 p.m.